Lockets are a beautiful way of carrying a picture of your loved ones around with you at all times, always close to your heart where you want them to be. Show your wife and daughter you love them with these beautiful polished sterling silver heart lockets, featuring a silver locket alongside a personalised initial charm and a birthstone for their birthdays. 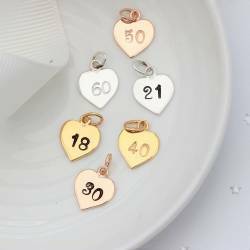 It would also make a lovely gift for a bride on her wedding day, as she can wear the childs size and the adults can be given to her Mum to celebrate this special day. 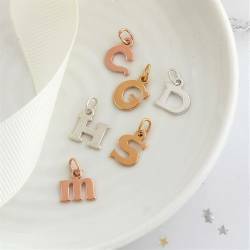 Each locket will come with an initial charm and a birthstone. The stamped initial and number charms are patinised, which makes the characters darker so that they stand out against the silver (black finish) or we can leave them silver (clean finish). Once we’ve created the perfect heart locket necklaces for you, we’ll carefully package it in one of our beautiful black gift box for adults and amethyst for childs with a birthstone gift card. We’ll then finish it with a flourish of ivory ribbon ready for you to give to the lucky ladies. The sterling silver box chain is available in 4 lengths approx 14"/35cm (young childs) 16"/40cm,18"/45cm and 20"/50cm.